Herbed Cauliflower Rice Stir Fry is a healthy and delicious low-carb side dish. Full of flavors, super easy to make and ready in 15 minutes. What’s your favorite vegetable? Mine is zucchini in summer and cauliflower in winter. I love to experiment recipes with these two because they are both versatile vegetables and you can create quite surprising dishes with them. This Cauliflower Rice Stir Fry is my latest recipe that I’ve made especially for the picky one in the family (hello hubby!). You know what? He loved it and ate the whole bowl. Although we love rice as a side dish, sometimes we need more vegetables in our life. I mostly combine rice with a vegetable in those cases as I do in my Cheesy Zucchini Rice. On the other hand, it’s better to leave rice out and have a more plant-based side dish when you need something lighter, low-carb and low-calorie. This is one of the easiest side dishes. Use your food processor to make cauliflower rice. Pulse until you get small pieces, so it looks like rice when cooked. Heat olive oil or another oil like sesame oil or coconut oil in a large skillet over medium-low heat. Add cauliflower rice. Stir-fry for 3-4 minutes or until the cauliflower rice gets tender. Add in minced garlic and lemon zest. Season with salt and pepper. Don’t add the salt earlier, otherwise the cauliflower rice starts to release moisture and it won’t be a stir-fry any longer. Cook for another minute and remove from heat. Toss in the chopped herbs and pour lemon juice over it. Give it a good stir and serve hot in bowls. I don’t use any sauce on it because it doesn’t need additional flavors for me. Garlic, lemon and herbs work just fine. On the other hand, if you want more flavors that remind you of a classic Chinese stir-fry, try Michelle Tam’s All Purpose Stir-Fry Sauce. Is Cauliflower Rice Stir Fry Low-Carb? Who doesn’t like fried rice? It’s one of my favorite side dishes to pair with dishes like Simple Roasted Chicken. However, it’s a great idea to replace rice with cauliflower when you want to cut down on carbs. 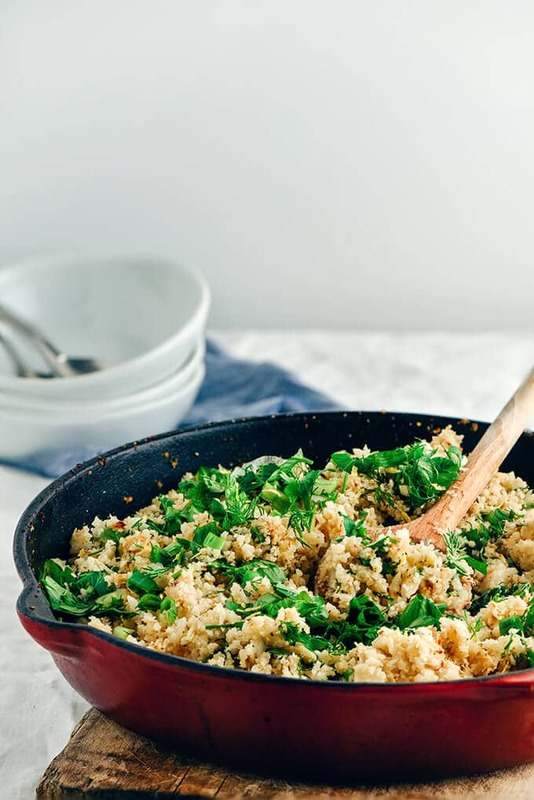 Cauliflower rice is not only low-carb, but it is also gluten-free and surprisingly tasty. I try many recipes woth cauliflower as it’s my favourite vegetable so far but never tried to chop them into chunks like this. I like the way you combine the light yellow and green among ingredients. Hi Natalie! This is a great recipe for true cauliflower fans. Quite versatile too. You can add chicken, beef or cheese if you’d like to add some protein. What a great recipe! I love Cauliflower. Thanks for sharing this recipe. I will try to make it. Keep it up!! 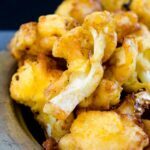 Cauliflower is a favorite vegetable in our house year round too. I make a similar dish so I know how yummy this is. And the addition of dill is such a great idea. Thank you my friend! You know what? This is even tastier when it is cold. And I guess this is thanks to the herbs I use in the recipe.